Customers love gifts and give-aways…especially ones that provide value to them. This usually involves giving away one of your products for free or a sampling of valuable information, creating a real “win-win” for you and your customers. But, what if you could make it a “win-win-win”? Two companies, both part of the larger New Indy Containerboard umbrella, accomplished this over the holidays by involving suppliers, “sister” companies and customers. 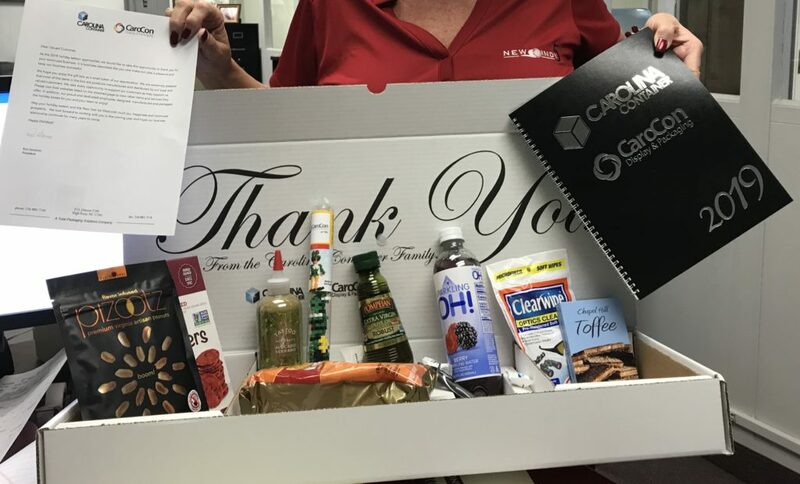 At Carolina Container, the marketing team started a 4-month long process of designing a customer holiday gift box with brainstorming how to showcase what they do best: provide structural support to products. So, what better products than those of the companies they sell to and buy from? In addition, if they kept a simple, minimalistic design, it could be re-used far past the holiday season. 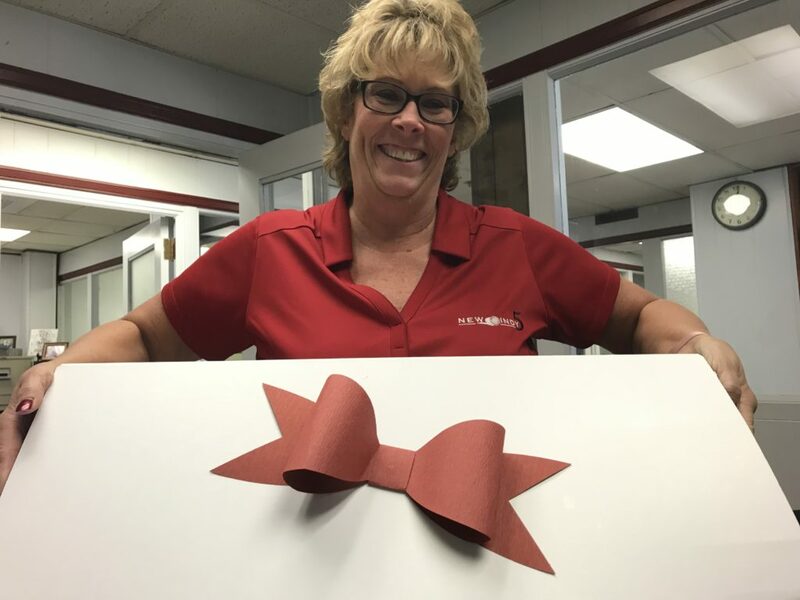 The result was a mottle white kraft box filled with customers’ products, a letter including brand logos/info, and topped with a removable, red crepe paper bow. Ivex’s Angie Spann w/ gift box & red bow. “Not only do people enjoy that unboxing experience you get with a sleek, minimal design, but it also showcases all the turnkey opportunities we have at the company. We involved teams of people around creative layout, structural design, digital printing, contract packaging and even the plain brown kraft box built around it for shipping,” says Michael Haselden at Carolina Container. 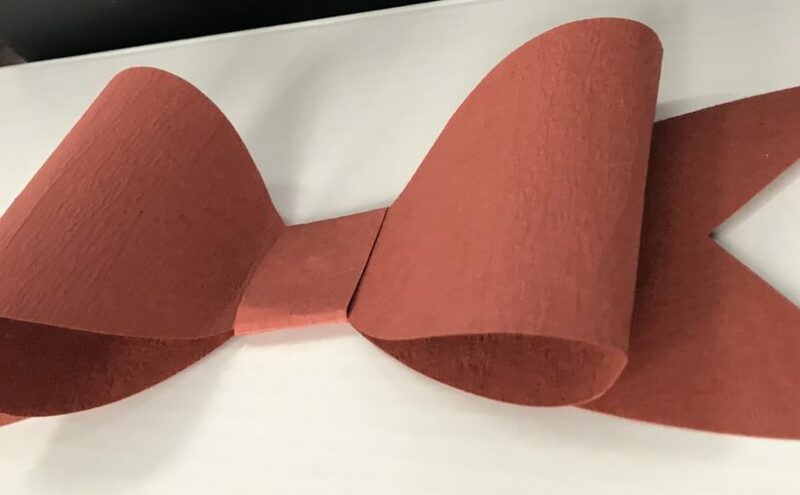 Carolina Container’s sister company, Ivex Specialty Paper, provided that heavyweight red crepe (116 gsm) used to make the holiday bow topping it all off. Meanwhile, the 107-year old paper mill was assembling a similar holiday gift that not only showcased capabilities, but also offered surprising positioning in unfamiliar markets like fine paper and bags. 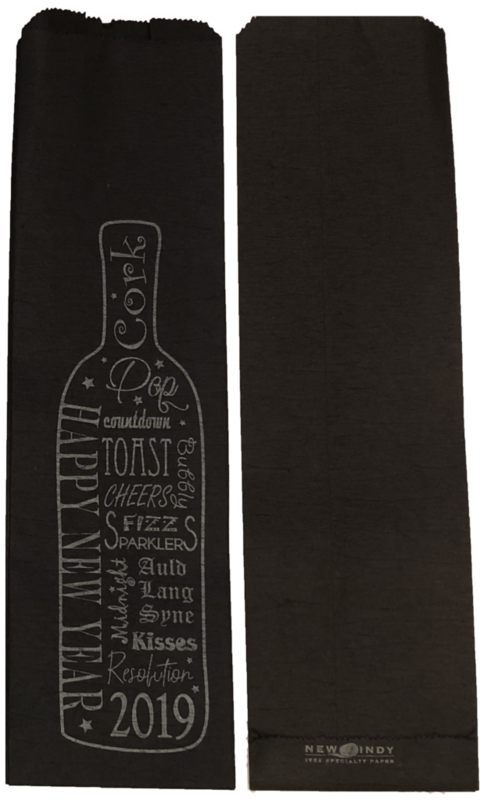 In 2017, Ivex’s innovative mill sent gift tags made of heavyweight, white crepe with foil-stamped holiday designs and sayings. Converters and printers, who would normally be customers of the mill, instead were showcased in the gift. In 2018, Ivex once again teamed up with a converter: this time to create heavyweight, crepe “wine” bags. 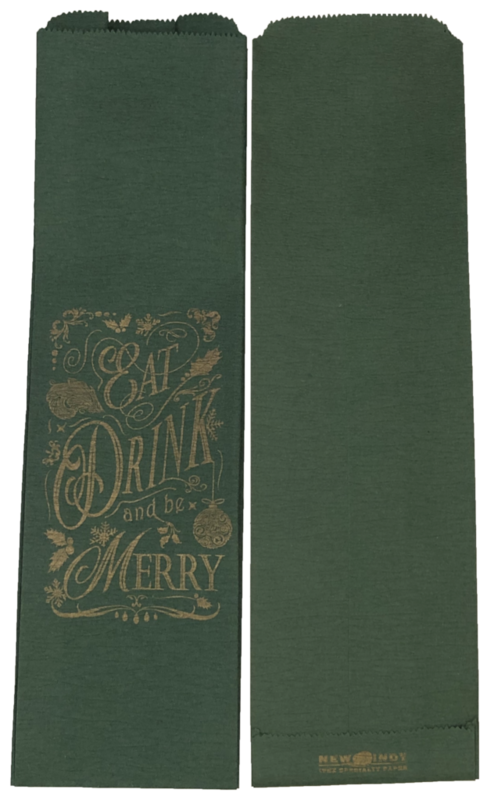 Two 6.5”x19” pinch-sealed bags with “Merry-And-Bright” and “Happy New Year” themes were created from heavyweight (116 gsm) crepe paper. The green bag featured gold flexo printing, while the black bag showcased silver ink. Besides obvious design and branding value, the bags also provide a high level of cushioning to the wine, champagne and other holiday beverages they carry. “It’s all about providing value to customers and our team has done it for over a century. There aren’t a lot of options for bags in colors other than brown/natural UNTIL NOW and you definitely won’t find our crepe texture anywhere else. It’s a gorgeous bag meant for discerning customers looking for something in between the basic brown bag and more expensive, elaborate packaging. And it’s sustainable to boot,” according to Bill Platt, General Manager at Ivex. As you decide on your give-aways and this year’s holiday gifts, remember the relationships you have with your customers, suppliers and corporate “sister”/“cousin” companies. Think about what value everyone brings to the table and how you can help support one another. Take it from Carolina Container and Ivex Specialty Paper; showcasing each other’s work is never a bad place to start. Carolina Container was founded in 1928 and has earned a reputation as a customer-focused manufacturer of quality corrugated products for the past 90 years. Carolina Container has a strong tradition as a leader in the corrugated industry after starting out as a corrugated box company that made shipping containers for the furniture and textile industry. Today, Carolina Container leads the industry in operational excellence with 10 plants and more than 700 dedicated employees in Georgia, South Carolina, North Carolina and Virginia. For more information, visit www.CarolinaContainer.com. Ivex Specialty Paper has manufactured heavyweight, machine crepe and specialty kraft papers in a variety of colors and coatings for over 100 years. The mill has been using 100% recycled paper as its main fiber source from the beginning, offering a truly sustainable option for customers in any industry. Ivex’s paper machine has a small footprint, allowing for low volume runs, custom orders and room for innovation. Ivex was first used in tape for bag closure and carpet seaming. Now, products are sold to a variety of industries for use in industrial, commercial and retail applications. For more information, visit www.IvexSP.com.